While the 2019 MLB season is less than a month in, one trend is destined to define this year and the future. When everyone looks back on this season, it will be remembered as the year of contract extensions. Free agency delivered a few big contracts for baseball fans during the winter, however, the real flurry of deals started to roll out during spring training and they haven’t stopped. Many of baseball’s top stars, like Justin Verlander, Paul Goldschmidt, Chris Sale and Jacob deGrom, signed monster extensions in recent weeks. Even more so than the veterans though, pre-arbitration eligible players are landing massive extensions. From the outside, this seems like a great thing. Young men who spent years of their life training and working to make it to the majors are now receiving life-changing contracts for themselves and their families. Unfortunately, these contracts are the direct result of exploitation by owners from across the league and could ultimately cost these players and their peers far more than they realize in the long-term future. The problem: After more than two years of free agents finding a barren market with very few teams spending money, the allure of hitting the open market is now gone for young players. While Bryce Harper and Manny Machado signed record-breaking extensions, they are exceptions to the increasing trend and rare MVP-caliber players who reached free agency at the age of 26. Meanwhile, All-Star pitchers Craig Kimbrel and Dallas Keuchel remain free agents, even during a time when contenders hold pressing needs in the rotation and bullpen. Among the 220-plus listed free agents by MLB.com, 75 signed one-year deals, 85 signed MiLB deals and 24 remain free agents. More than 84 percent of the league’s free agents are either without a contract or forced to take the risk of a one-year deal. The effect: It’s now a system set up perfectly for front offices and ownership to manipulate, using every part of what they created to their advantage. For a majority of players, free agency is approaching a no-go zone and young players are still seeing their service time manipulated to control how long they are kept under contract. Pre-arbitration eligible players are seeing how the open market is changing with ownership across the league cutting spending while MLB experienced a record-setting $10.3 billion in revenue in 2018. The fallout: As a result, players who have already seen their own or their peers’ service time manipulated with the chance to enter free agency delayed by their own clubs, the likes of Aaron Nola, Ronald Acuña Jr., German Marquez and Ozzie Albies are giving up free agent years as part of contract extensions. Meanwhile, the Chicago White Sox cited a need for further improvements as the reasoning to keep top prospect Eloy Jimenez in the minor leagues, until he was suddenly deemed ready by the same front office after signing a team-friendly, six-year contract. If young men have worked and produced more than enough to make the majors don’t want to play along and sign a long-term contract on the team’s terms that limit their future earning potential, then they’ll often be kept in the minors until their service time is toyed with to gain extra years of contractual control. Braves taking advantage: While every team is trying to take advantage of the system they’ve all created, Atlanta Braves general manager Alex Anthopoulos is lapping the field with these team-friendly deals. Atlanta kept two of its franchise cornerstones for the next decade and the two contracts combined only will cost the organization a maximum of $169 million. The Braves bought out arbitration and four free agent years from Acuña and Albies, taking away their chance to fight for a higher salary in an arbitration case and have teams compete for them on the open market. 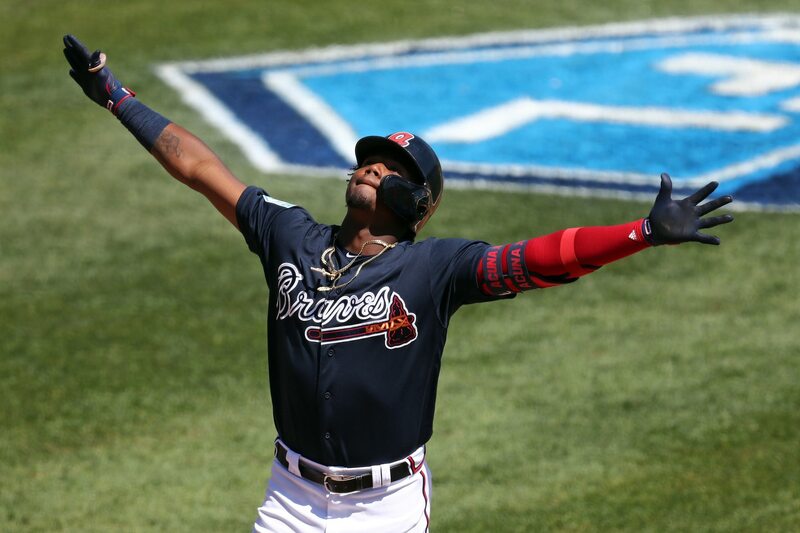 As mentioned by ESPN’s Jeff Passan, Atlanta turned $450K in international spending on Acuña and Albies into potentially hundreds of millions in value gained and took advantage of circumstances in Latin America with both players coming from a lack of means before they signed. Moving forward: Acuña, Albies, Nola and Jimenez all took deals that most likely will cost them in the long run. While the immediate reward of tens of millions of dollars will help their families, these deals take away any chance for bargaining power they had and will lead to them being grossly underpaid compared to their value in the future. Albies’ extension is already being described as one of the worst in MLB history for a player. It’s going to be a problem for Albies years down the line and other MLB teams will try and use this as precedent for future contract extensions with players just like Albies. Even more problematic, these contracts will leave many of their peers in more difficult circumstances moving forward. Some will ultimately settle for below-market deals just like these, sacrificing their free agent years and losing tens of millions in the process. Meanwhile, more young players signing these extensions will make it less likely for an MLB strike when the collective-bargaining agreement ends in 2021. This in itself is a problem, given all of the issues in the system. As profiled in Emily C. Waldon’s feature in The Athletic, Triple-A players make an estimated $11-14K per year, Double-A players at $9,500+ per year and High-A and Low-A players average less than $8,500 per year. Issues with the service-time manipulation, which keeps many players away from free agency until after they’ve accrued six years of service time. Issues with minimum and early salaries for players with the current minimum salary sitting at $555K in 2019. Addressing MLB’s luxury tax, which rose from just $155M in 2008 to $197M in 2018 despite MLB seeing its revenue double over that same span. Addressing the qualifying offers and draft pick compensations with loss of draft pick often cited by teams as reasoning to avoid signing to free agents. Owners across the league were already gaming the system and taking advantage of every rule and maximizing it to its fullest extent. As soon as chatter picked up about the players potentially striking in 2021 and playing the one and only hand they hold in negotiating, team-friendly extensions started being put out every few days. There is a real danger here for players and one that must be addressed even as some are cashing in. While these contracts offer life-changing money to young men who have never imagined having millions for them and their families, it hurts their peers chances of providing for their own families in the future and puts even more power right in the hands of billionaire owners.